Guitar recording software with effects, online collaboration. Is there a better alternative to RiffWorks T4? Is RiffWorks T4 really the best app in Audio category? Will RiffWorks T4 work good on macOS 10.13.4? 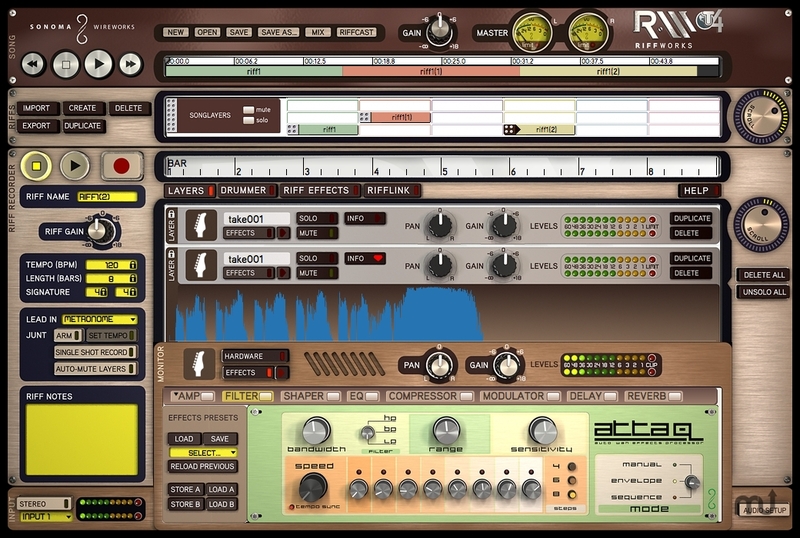 RiffWorks T4 is a free edition of RiffWorks guitar recording software that includes looped recording, automatic track creation, InstantDrummer, effects, song posting, online collaboration, and a "Quick Start" tutorial in 14 languages. Includes automatic track creation and loop recording with four layers plus drum loops, seven effects, IK Multimedia's AmpliTube Duo LE guitar amp and effects plug-in, Gallo Engineering's Studio Devil BVC amp model plug-in, a free level of online collaboration, and other features. Record songs online with friends around the world for free! RiffLink users must update to 2.6.7 build 3508 in order to connect. RiffLink Import is now restricted to rwr files. RiffWorks T4 users can no longer import to a RiffLink collab as they cannot create rwr files. RiffWorks T4 users should upgrade to Standard if they would like to import to RiffLink. RiffWorks T4 needs a review. Be the first to review this app and get the discussion started! RiffWorks T4 needs a rating. Be the first to rate this app and get the discussion started!